The Pakistani actor isn't the only one excited about her Bolly debut. Momal's Sheikh's upcoming Bollywood debut Happy Bhag Jayegi has everyone on their toes. After the trailer release, fans can hardly wait for what she has in store for them. In a brief interview with Images, the Pakistani actor spoke about working across the border. Images: How was your experience of working in Bollywood? 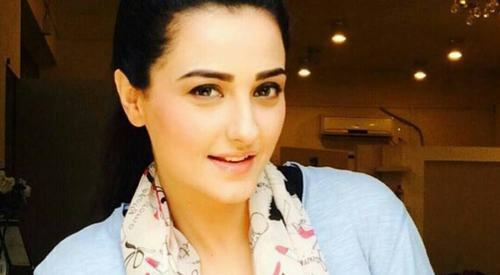 Momal Sheikh: I was very fortunate to sign up with a good team and fine actors. Many concepts were rather new to me since film is very different from television. The platform itself is a very challenging ground and makes you push yourself very hard. I loved taking up the challenge and I'm excited to have had the opportunity to work with such sophisticated equipment and deliver to a much wider audience. Images: Did you have any scenes with your dad? Was it daunting to work with him or an exciting opportunity? Momal: Yes, my father and I shot a couple of scenes together. He is my mentor, my counselor and obviously my critic as well. I knew he would guide me and judge my work honestly. I'm grateful that I had him by my side during my first Bollywood venture. Images: Can you tell us a little more about your character. We know you're Abhay Deol's wife but what more can you reveal? Momal: I am playing the role of Abhay's fiance, Zoya. An entrepreneur of a fashion house, Zoya is a strong-willed girl and holds her ground. She is confident and mature as is reflected in the way she eventually handles the odd situation she has to deal with. I don't want to give away too much but I will tell you this: you will be surprised by a few twists in the story, especially when Zoya plays a vital part in deciding who Happy will eventually settle for. Images: We like your look in the trailer. Who are you wearing and who styled you? Momal: Thank you! My stylist was Ankita, who worked with me throughout the movie and I must take this opportunity to thank her for her patience and professionalism. Did you do any dancing in the film? Momal: I have no dancing numbers. Momal's definitely upped our anticipation and we're eager to see what she has to offer when the film hits theatres on August 19th. Is Happy Bhag Jayegi an imitation of Runaway Bride? Very broad-minded because I believe she is married. Good to see such liberal husbands from Pakistan. The trailer looks really good and the movie looks entertaining :) all the best. I am glad at least the artists in India are pro-peace if not the government. We give respect and honour to those who are doing good work irrespective of nationality. momal is doing a great job for their country. She is bringing good name for her country i.e. Pakistan. She is proud of Pakistan. It is very difficult to get job in throated cut competition in Bollywood movies. Why we have to go to Bollywood ? Do not we have talent and brains in Pakistan? It is not criticism but an encouragement in a positive way. Bollywood just feeding fish to our actors but do not want them to catch. So, we always be dependent on them plus they are making a lot of foreign exchange from Pakistan . Think about it. indians always want actors that look nothing like real indians. For a country of over a billion people they rely alot on people from Pakistan. Pakistani artists should also realize the importance of developing their own industry and forging relations with other non-trivial movie industries (Hollywood, Lebanon, Iranian, South American or Italian Cinema) which they can then bring back knowledge to help our own industry. I saw her perform in Comedy with Kapil, just average! She doesn't carry the credentials, like body exposure , of Item Number and hence not likely to succeed! Anyway, one wishes well for her, although I would have liked her to remain limited to TV dramas in Pak! @Brainy Bhaijan So what if she's married?? Personal & professional lives are separate & visible. Why think regressive?? India is big market & only who is fit will survive. Wishing her great success. Pakistan and India should not collaborate only in movies. They should work on accepting each other as two different nations and to letting Kashmir decide its fate. @Ahsan Gul Because they pay BIG money.... You don't get paid enough doing Pakistani movie.